Were I to set more store by the zodiac, I’d blame it on a Cancerian date of birth. Perhaps it has more to do with past-life experience, or maybe it’s just one of those things. Either way, the fact remains: my thoughts about leaving the house generally range from ambivalence to reluctance. I use the word house loosely, as it is neither manor nor cottage, nor even a town maisonette, but a single room by a railway line. I fancy I could live quite well somewhere as an anchoress, so long as there’d be Wi-Fi, and deliveries posted through a hatch in the wall. The only other concession might be a little patch of garden. A kettle. A heated towel rail. I wouldn’t ask for much. What could impel me then to squash bedding and four days’ clothing into an improbably tiny cabin bag? What could induce me to share a room for five where mounting (and especially dismounting) a bunk will require the strangest contortions? What could draw me to the cattle-truck confines of a budget airline, not knowing where my next good cup of tea will come from? Reaching the Pyrenees meant an overnight in Lourdes – two trains, a bus, a brief hotel, another bus, plane and cab away from my northern English home. Though life has brought me almost no experience of Christianity, I felt a kind of kinship with my fellow passengers – most of them clearly pilgrims, and in various states of health. I’ve waited in many an airport queue to have my tickets inspected, my bags rummaged and my person scanned for weapons. Never have I seen a queue so cheerful, so calm or polite than the one for Lourdes. At Lourdes we would be three, and could make a small adventure between us. Although it rained prolifically, doggedly – one could almost say spitefully at times – everything but our enthusiasm was dampened. I was struck by how real and recent was the life of Saint Bernadette. I think of saints as trapped in medieval carvings or unlikely illustrations, their humanness censored and their stature extended out of all proportion. How is one then to separate miracles from the vagaries of imagination? Like Thérèse of Lisieux, Bernadette Soubirous was alive in the late 19th Century. She has photographs. I have seen her little wooden shoe behind glass, the dress she embroidered, letters she wrote home to her brother from the convent in Nevers. I’ve stood inside le cachot – the dungeon – where she lived in poverty with her family at the time of the visions. I’ve looked on the very bed where she slept. While the countless gift shops are rather too gaudy and sentimental for my taste, the atmosphere at Lourdes is distinctly numinous. It also has particular qualities one might call feminine. That which is pure, gentle and nurturing is often overlooked in the West, written off as trivial or weak. I wonder, is that why God chose a simple girl of 14 to receive the visions, and specifically visions of a young Virgin Mary? There was to be a military parade in the town that weekend, soldiers from many countries convening for services, marching the streets in elaborate uniforms, marking time with drums and shiny brass instruments. While that seemed to me rather incongruous, I suppose the chance arrival of the Peace Run seemed to them equally so! We could not light our torch, but unfurled our banner all the same, and processed to the sacred grotto for prayers and pictures. Queuing for water in the rain may sound pointless, but it was the only way to drink from the spring that appeared at the feet of Bernadette. Families waited with us under capes and umbrellas, chattering in various languages, filling anything from their hands to glass phials and plastic gallons. Lourdes may not be an outwardly peaceful place, but inwardly, yes, and a happy place too. I was often reminded of our own gatherings in New York. Time slows down. The boundaries between people are softer than usual. What was once a rubbish dump is now a shrine, trailed with vines and wild roses. One can pass by the edges of the cave and touch its surface. Long candles of white and blue blaze at the entrance, and thousands more wait their turn on covered tables, imbued with the prayers of those who offered them. The enormous basilica of grey stone grows as though from out of the rocks. The river Gave churns and tumbles beside it, all milky molten turquoise. Our true destination was Gavarnie – its falls forming the source of that very river. Sri Chinmoy encouraged a special bond between our French and British Centres, and asked that we all meet four times a year for Joy Days. We may do the same things each time – meditating, singing, playing games, sharing meals, news and inspiration – but each brings a new experience. After a languorous breakfast, most of us walked. Some of us ran. Even from the window of our gîte, I struggled to take in the scene. First there was the fat green of the ground, acres of open meadow, each blade in its Sunday best, the leaves and needles of trees outgrowing their winter jackets to stretch out bare and shiny. But up there, where there would be sky, was an amphitheatre of limestone, dark and ruckled, draped in snow, crested in ice, coddled in cottonwool clouds. And drawn down the middle as though in dusty chalk, La Grande Cascade, the highest waterfall in all of France. Only then came the canopy of violet blue, and a very buoyant sun. The warm air rang with birdsong. Butterflies were at their leisure, playing tag on the breezes – black, white, orange, yellow. Even ants and flies and beetles looked well fed. Bees were just as comfortably off, surveying their estates and muttering approval – blue gentians and purple orchids, too brilliant for the focus of human eyes. The scent of pine in cool arbours. The scent of earth in sunlight. Trails were dotted with seasoned hikers and Sunday ramblers, tracking the river upstream to its source. Giant raptors wheeled above in their dozens – vultures or eagles, too high to tell. Below, each crevice spilled with melting snow and white noise. It chuckled and funnelled into pools sheer as glass, then drove recklessly on, crashing and overtaking itself, ecstatic to be free of mountain stone at last. Whoever thought to build a hotel so high? That meant a cup of tea. A good cup of tea, and all the better for climbing. We talked of concerts, classes, other Joy Days past and yet to come. We stared into the splendour and said nothing at all – that comfortable silence enjoyed only in the best of company. The more intrepid clambered over a moonscape to the snows and the falls. Donkeys lumbered up the slope to be tethered by the grass, so their little passengers could shout and run and drink soda. In time we ambled back to the village, ate bowls of ice cream made of local berries, and sat amongst the meadow flowers listening to cuckoos. We drove to Luz-Saint-Sauveur for galettes with native cheeses and crêpes with sweet marrons, then scrambled into our bunks to read, welcoming the sudden sleep that follows a day in mountain air. Most left next morning with the Peace Run, and there were three of us again. We met nobody on our walk that day, save the birds, butterflies, and Notre-Dame des Neiges – Our Lady of the Snows. 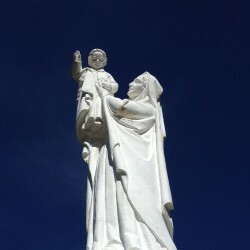 Her statue towers over Gavarnie, holding the child Jesus aloft as he blesses all beneath. Warmth, purity, gentleness against a rugged, icy backdrop. Driving to Lourdes I realise I’m not ready to go back home. Strange for a would-be anchoress. These days have surely fed the soul, fed the heart, fed the physical existence. What else do I need? This adventure inspired me to find out more about Saint Bernadette. 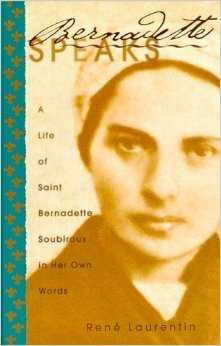 If you’re ever interested in doing the same, I highly recommend Bernadette Speaks: A Life of Saint Bernadette Soubirous in Her Own Words, by René Laurentin. This is a real treasure, meticulously researched and carefully presented. Laurentin has endeavoured to stand back and let Saint Bernadette speak for herself as much as possible. At first glance this seems like a rather hefty textbook, but Bernadette comes to life so clearly in the pages, the result is enthralling. She feels accessible not only through the relative recency of her life (1844-1879), but also through her very human struggles, her simple background and her pragmatic nature. I had trouble putting this book down. Thanks so much for your visit, Purna-Samarpan! Very glad you enjoyed the little report.